Note: This is the third in a series of blogs about the functionality and potential of custom end user mobile apps for nontechnical owners or managers of commercial buildings. Most of us agree that our daily lives have changed significantly thanks to all the services we get from the Internet, mostly free of charge (thanks to financing from generous advertisers and sponsors!) Like so many others, you may be considering creating your own mobile apps to deliver added value to your customers, specifically building occupants. What are my options for creating the mobile app? And why does it usually cost so much to create the mobile app? Just take few minutes to browse your preferred marketplace for a mobile app, such as the App Store or Google Play, and you will have a sense of the vast number of apps available, something for nearly any interest. But the majority of these apps address only the most common needs, such as for communication (Skype, iMessage, FaceTime), social networking (Facebook, Twitter, Instagram, LinkedIn), editing photos and videos (Snapseed, VSCO, Mextures), and of course for travel (Waze, Google Maps, Uber and Lyft). 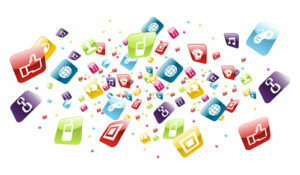 But when it comes to specific apps dedicated to a very targeted audience, the options become much more limited. For example, where do you find an app to adjust the blinds in a hospital room, or to order room service from your hotel room? They may be tough to come by – or are they? Of the more than one million apps you’ll find in the various marketplaces, most were created on the cheap by independent developers and, as the story says, “the bulk of these apps will never earn a penny.” When it comes to developing the apps we associate with large companies such as Facebook, Skype, LinkedIn, Google Maps and the like, it takes teams of developers that can range into the hundreds of engineers – which is where the expense comes in. So, where does that leave a company that wants to create a useful app for its building occupants and customers? Historically, you’ve had two main options. If you are dealing with economic constraints – as most are – you will have to find one or more apps in the marketplace that can meet your needs. The result won’t likely be exactly what you wanted but it may be an acceptable compromise. Now there is another option that enables you to design and develop an app that has aesthetics and function similar to the high-quality apps you’d find in an app store, but performs the exact functions you need to control and offer services within building environments. Schneider Electric AdaptiApps is a cloud-based solution to design and deploy apps that are customizable for different end users, depending on their roles. The apps give them the ability to monitor and control building systems and access services that are most relevant to them. To learn more about just how easy developing custom end user mobile apps can be, check out this video about AdaptiApps. Also check out my first blog about how a single mobile app with multiple functions and a consistent look can differentiate highly competitive service-oriented business like hotels, hospitals or apartment complexes. And for those who are building experts and not mobile technology experts, you may be interested in my second blog about how the data and services for commercial buildings get aggregated and delivered via a mobile app.